At the time of me writing these paragraphs, I haven't heard too many Big Finish audio dramas. In fact of this exact paragraph, I've just heard one. In that there weren't any new companions so I'm not up to date with all of their histories. Yet this one seems to be a rather revealing one for a new companion for the Sixth, which is good because he needs someone who wasn't Peri or Mel. "Finally, the Sixth Doctor challenges Charlotte Pollard to tell him the truth. Who is she really? What is she doing in the TARDIS? Who is Patient Zero? What has happened to Charley? And why have the legendary Viyrans been summoned?" What do you think? Were you still invested in who Charley is? Did you think this would tie into Prisoner Zero? What else do Daleks crave? Cheeseburgers? Ok, I thought this one was pretty cool. The last one I listened to was 'Brotherhood of the Daleks' and this picked up really well right after that with the story surrounding Charley. The idea of the virus is really cool, changing people into 'something else' and Myla sort of manipulating it so her and Charley essentially switch places. It was a touch confusing at some points, but it all comes together pretty well. I don't even know how I'm supposed to feel about Myla...and I sort of hate how this all worked out. I mean, are we just forgetting about original Charley and rolling with Myla-Charley? It's weird. I needed this one. I had a stretch of just okay audio dramas and this was a really solid story. 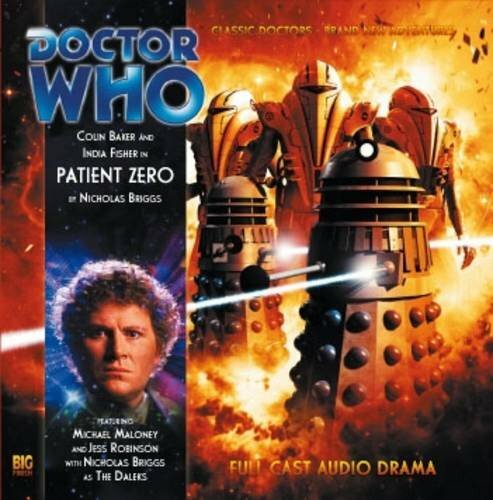 I liked the mystery involving the girl that Charley was hearing and the Dalek's obsession with this Patient Zero. Also it didn't wrap up everything at the end. I look forward to finishing this marathon so I can get to the stories right after this. This is one of the best stand-alone adventures.